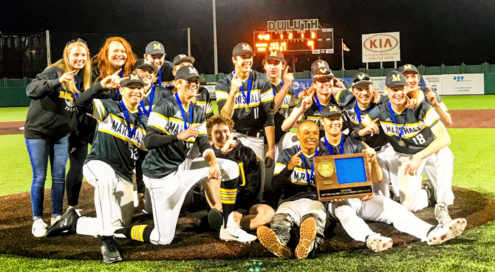 The Duluth Marshall Hilltoppers have captured the Section 7AA title for the second consecutive season. The Hilltoppers needed to win two games on Thursday and they did just that, topping the Esko Eskomos by scores of 4-1 and 23-1. In game one, Brett Benson received the win. He allowed just one run on six hits through seven innings. Derrick Winn led the Hilltoppers offensively with two runs batted in. Eric Rish got the loss for the Eskomos, pitching 4.1 innings, allowing four runs on two hits while walking six batters. In game two, the Hilltoppers fired on all cylinders, dominating the Eskomos 23-1. Carter Sullivan was the winning pitching, allowing one run on three hits. Offensively, Tyler Johnson and Peter Hansen were perfect at the plate. Johnson went 5×5 with a double and five runs batted in, while Hansen went 4×4 with one run batted in. The Hilltoppers (21-4) will continue their season in the Class AA State Tournament. They received the top seed in the tournament and will face the St. Cloud Cathedral Crusaders (17-8) on Thursday, June 14th. The Eskomos finish their season as the Section 7AA runners-up with a 21-5 record.